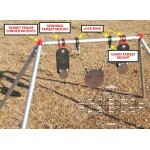 These deluxe target frame brackets are used as the building blocks for a portable target hanging sys.. The STS Budget target frame brackets are designed to enable shooters to put together a target f..
Now also available in bare steel for an even cheaper price! The target mount is designe.. This target spinning mount is designed to sleeve over 25NB pipe (~OD 33mm), and be held in position .. This mount is designed to sleeve over 25NB pipe (~33mm OD), and lock into place with an M6 grub scre.. Replacement 5mm long arm allen key for use with M6 Socket Head bolts. Manufactured from chrome va.. Replacement Shaft Lock pin for the STS Steel Target Frame. .. Replacement 3mm allen key for use with M6 Grub Screws on the STS Steel Target Locking Rings. Nick.. The STS Paper Target Struts are specially designed parts allowing the supporting of corflute or card.. 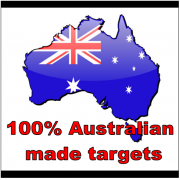 This brand new STS product make swinging your gongs cheap and easy. The STS Dropper Topper Target Fr..
Want a quicker method of attaching / detaching your steel target? It doesn't get much quicker than b.. This Chain target mounting kit includes: 2 x ~220mm 8mm Grade 70 High Tensile Chain Sections 4.. Kit includes: 2 x ~200mm long heavy duty reinforced rubber strips, 4 x M10 bolts, 4 x M10 nyloc nuts..